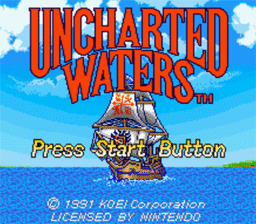 Uncharted Waters revives a time of romance and adventure; the Age of Exploration. In 1502, ten years after the immortal voyage of Columbus, you assume the role of a young Portuguese captain. Your goal is to attain glory and restore honor to your once noble family name. This will be no easy task. There are distant shores to seek, pirates to battle, priceless treasures to plunder, and a beautiful princess to rescue! You can realize the dreams of a 16th century explorer in your own way. Play the part of a merchant and barter for precious treasures. Or, play the part of a ruthless pirate and make others pay the price of your fame. You decide your own fate when you embark upon the high seas. Anchors aweigh! --From the NES Uncharted Waters instruction manual. This game was a very complicated and fun game. There were a lot of things you could do from piracy to diplomacy. You could gamble in the towns or go somewhere and invest in a business. The graphics on this game were pretty good for a NES game. This game is good for hours and hours of play, and has high replay ability. I think this is a good game if you are looking for a good strategy game. Welcome to 16th century Europe, the age of sea travel and exploration! You enter a time when adventurers competed to open sea routes to new lands. You are the last in line of a family which once enjoyed the luxuries of a noble life. Your family has been reduced to poverty ever since the demise of your grandfather. In an attempt to win recognition in the annals of sea-faring history, he went down with his fleet off the coast of Africa. Your father renewed your grandfather's quest, but once again the sea triumphed and he succumbed to the waves. The previous century saw the successes of three renowned explorers. In 1487, Bartholomeu Dias landed at the southernmost point of Africa and named it the Cape of Good Hope. Five years later Christopher Columbus celebrated his discovery of the New World, in 1492. Finally, in 1498, Vasco da Gama opened a sea route to India! Now the year is 1502, and the challenge is on your hands. Gain fortune and fame and restore your family name to honor. If you're a true salt, you should complete your journey before 1522. 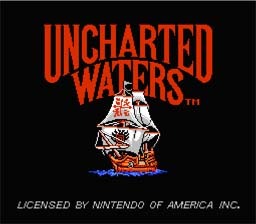 --From the Super Nintendo Uncharted Waters instruction manual. 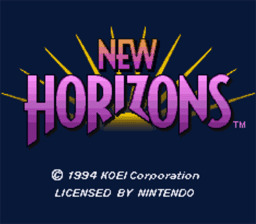 The story of New Horizons takes place during the Age of Exploration. This time period was marked by the great technological advances in shipbuilding and navigation which spurred explorers to travel across the world's seas. The discovery of new lands offered explorers tremendous opportunities or adventure, wealth and fame. As a result, major European countries sought new territories and wealth as they entered a fierce competition to establish strategic strongholds in Africa, Asia, and the New World. 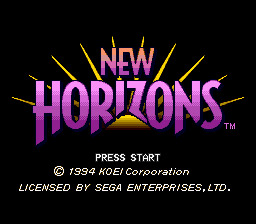 New Horizons begins in 1522, the year that Magellan's crew returns from its unprecedented around-the-world voyage. The amazing journey seems to prove that the earth is round, yet many still remain skeptical of this view. With the lack of a reliable mapped chart of the entire world, extensive exploring ventures will be contracted out to able, adventuresome sailors. Most of the world is just waiting to be discovered. As an ambitious young hero or heroine, sail the seas and unveil the earth's secrets! --From the Super Nintendo Uncharted Waters: New Horizons instruction manual.